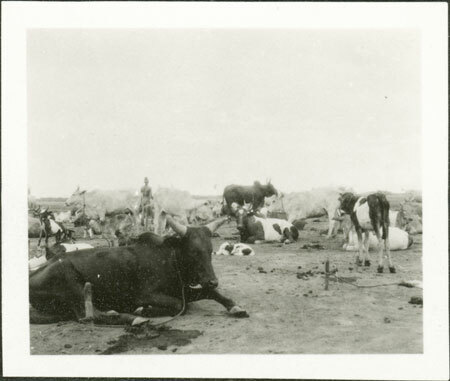 Oxen tethered at a cattle camp. One of the oxen is noted by Evans-Pritchard as a ma gut ox, a man's favorite ox that has its left horn trained across its muzzle by making a cut on the horn against which it will grow. This training is mirrored in the male practice of binding the left arm with metal bands called thiau, both of which are often done soon after initiation. Note on print reverse ms pencil - "2 153 "
Morton, Chris. "Nuer cattle camp" Southern Sudan Project (in development). 03 Jan. 2006. Pitt Rivers Museum. <http://southernsudan.prm.ox.ac.uk/details/1998.346.153.2/>.